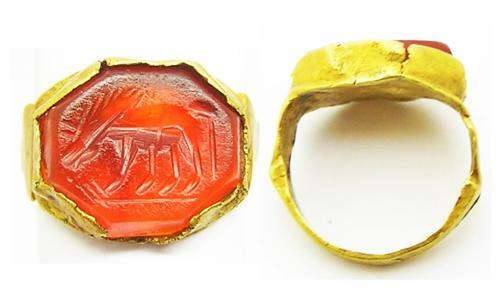 This is an ancient Roman gold intaglio ring, dating to the 3rd century A.D. It is set with its original carnelian gemstone, cut with an image of a grazing horse. The ring is in excavated condition, as such has been buried in the ground. The edges of the bezel are damaged, but the original gem is intact. The size of the ring would suggest it once belonged to a child. Today it will be possible to have the band made larger, or it is rather charming as it is!